What a splendid weekend we all had at Summer’s End in Lydney. We received an excellent reaction from the 250-strong audience on the Saturday night – all of whom stayed until the end of our 1¾ hour set. Some of you may also have seen a very positive tweet from PROG magazine editor Jerry Ewing, who told me on Sunday that he thought it was a really great show, and much better than he had expected..! Needless to say we are looking forward to all the reviews! 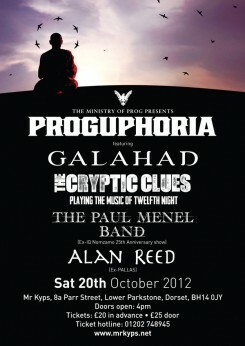 We were delighted to perform as special guests to our friends Galahad at their Proguphoria event on 20 October in Poole alongside Paul Menel and Alan Reed. Although the day wasn’t without a few problems, one of which resulted in a shorter Cryptic Clues set than planned, everyone there seemed to have a great time. Well done to all for the hard work to make it all happen! We are performing a full set at Danfest in Leicester on 24 November. We’ll be on stage at 6pm. Tickets here: also performing are Galahad, Also Eden, Magenta, Konchordat and The Gift.